Big changes make a difference to a space like swapping out an old sofa for a new one or repainting a wall in some hot colour but there are also plenty of little changes that make a whole lot of difference too. One in particular is door handles. Changing the hardware on say kitchen cabinets, bathroom cabinets, wardrobes and internal doors is a game changer. Trust me. I’ve transformed wardrobes and cabinets just by changing up the handles. When it comes to internal doors I’m a bit of a funny one. Unless I really have to have them (i.e on the bedroom and bathroom) they’ve all come off. Cannot stand for some reason doors especially when open against the wall, it changes the dynamic of the room to much for me. So you won’t find any here unless absolutely necessary. That said the ones I’ve got look so much better with black handles as my walls are dark. Two ways to go with handles make them disappear or make them stand out. I tend to make the ones on the doors go away and the ones on wardrobes stand. Purely because there are more of them and they can read as boring so it enlivens somewhat. This is a shot from the early days of our house when it was white. I transformed simple MDF doors by designing super long handles which I made from oak strips from the DIY store. Cost next to nothing and they looked amazing. 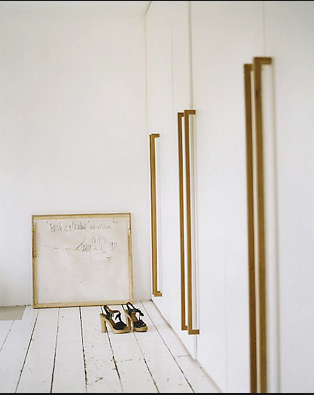 I also use coat hooks as handles on wardrobes – often larger than a door handle they look fabulous I find. Oh and I found this shot on pinterest just now which looks pretty darn cool I think! Happy Thursday. I’m about to walk the two M’s along the canal in the rain to our fav breakfast spot where the three of us sit outside by a lake drinking delish coffee. I don’t mind the rain actually apart from the fact that it makes both Maud’s and mine hair curl its kind of cleansing. It’s normally a weekend treat (going out to breakfast) but Mung’s has done something to his leg and is on strict instructions from the vet that for the next 2 weeks its lead walks only. Then possibly an operation which I’m hoping against hope he doesn’t have to have. Oh one more thing the journal should be going live today its looking amazing! Will post when its up and live! Hi Abigail, have I missed the big reveal of the new paint colour in your house? I hope not! Dying to see that. I always take the doors off too, so much better, makes the room look bigger. Don’t think I ever shut the lounge door so off it came!! 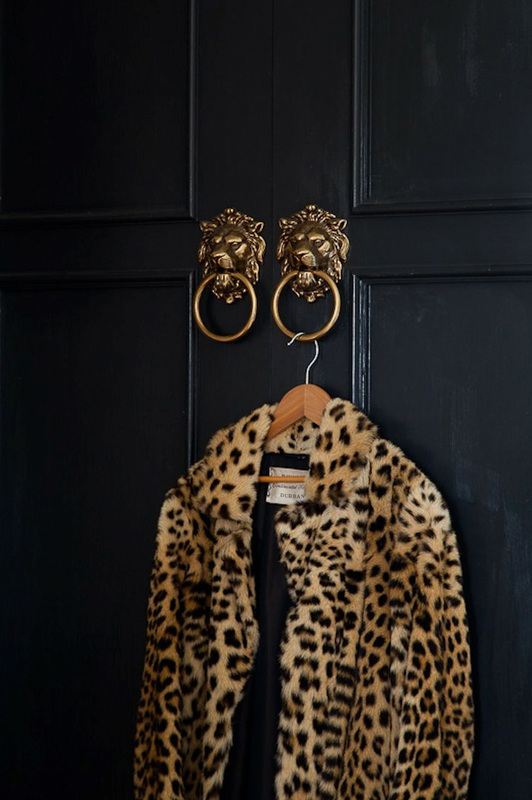 Funny, I just pinned that fab door and coat shot onto my Big On Black Doors board on Pinterest. Look for me at griffincharl if anyone wants more black door inspiration. I dispensed with a couple of our internal doors in London, but now we’ve moved to a house in the country I’m obsessive about having – and closing – them. Brrrrrrrrr. So excited to see my doors up here on your blog- love, love your work! Thanks for inspiring once again. Happy Nesting. Hi, I couldn’t agree more on this one – I work with old furniture – I repaint, refinish and change a few bits then and there and the biggest transformation (after changing the original colour) is the hardware. Beautiful hardware can transform any piece into something amazing. I agree with you a little change makes a difference!